Fall has been here for a while now, but to me there is a quite a difference between Halloween decorations and Fall Decorations. In my house we put up the Halloween decorations in October and take them down right after the 31st. Then, goes up the fall decorations. This is the leaves and plain pumpkins, gourds and harvest themed attire. While Halloween decorations are usually fun and creepy I try to make my Fall decorations a bit more classy because I host our family’s Thanksgiving every year. Now, we all know I like to save money and make things at home when possible so this year I am making my fall decorations myself. There was an earlier post of decorations made by my munchkins, you can find that here. But now I need something classier to dress up the house with. So, I made leaf bowls. These are gorgeous bowls, to add to any table or shelf, made from leaves. To complete this project you will need the following:I encourage you to use natural leaves from outside, but here in Florida leaves that aren’t fronds are difficult to find. So, we went to the dollar store and bought some autumn bouquets on sale and cut them apart (very cheap substitute). First, I would recommend covering your work space in either newspaper or pieces of scrap paper. This makes for a quicker and easier cleanup. Collect your supplies in one area, so that you aren’t hunting around for anything in the middle of your project. 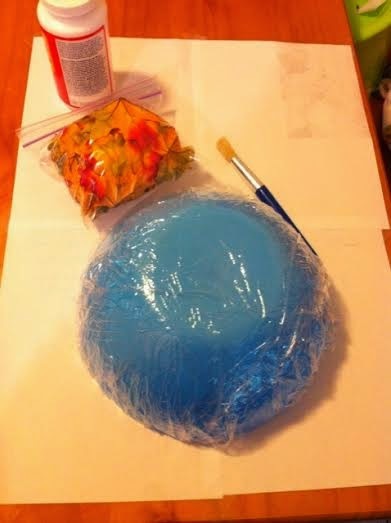 Next, cover the bowl you are using as a mold with wax paper. (I was out of wax paper so I used clingwrap :/ lol it worked fine for my purposes. It just stuck a bit to the leaves making some spots a little shinier than others). Wax paper is your best option because the glue won’t stick to it, only to your leaves. 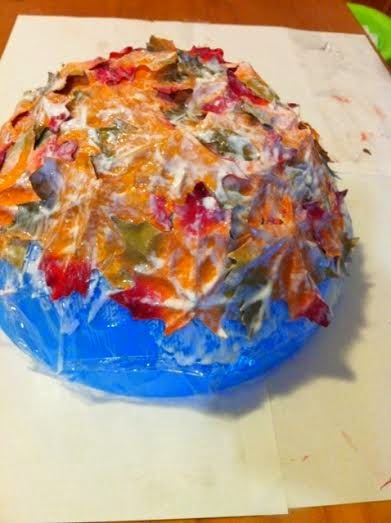 Take your leaves, place them on the bowl and cover them in glue. I used Mod Podge but regular Elmers glue will work just fine. It’s not necessary to glue the part you are placing down, just the top. We want the leaves to stick to each other, not the bowl or wax paper. Be sure to cover the entire side of the leaf with glue to make sure it molds to the position you want and to stick to other leaves. Layer the leaves slightly to make sure they stick to one another and cover any gaps. Your bowl won’t stick together well if there are spaces in between the leaves. Cover to bowl with as big or as little as you’d like your bowl to be. I wanted a fairly decent sized bowl so I used a larger bowl and covered most of it. Once you’re done gluing the leaves set it in a level, dry area where it will not be disturbed. Let it dry for at least 12 hours. If it still seems sticky or you still see white continue to let it dry. Once it is all dry, gently peal the wax paper off. Peal the paper away slowly, the leaves may try to stick in some places, gently work the area to avoid the paper tearing and sticking to your leaves or to have your leaves pull away from the collection. When the paper is all off you have a beautiful leaf bowl to show off. Side view of completed leaf bowl. I would recommend only filling with light objects. Anything heavy might distort the shape and make it flatten. My bowl is a little shinier than it normally is due to the fact that I used cling wrap and a thin layer of that remained with the bowl. It is hardly detectable however so if this is your only option go for it!